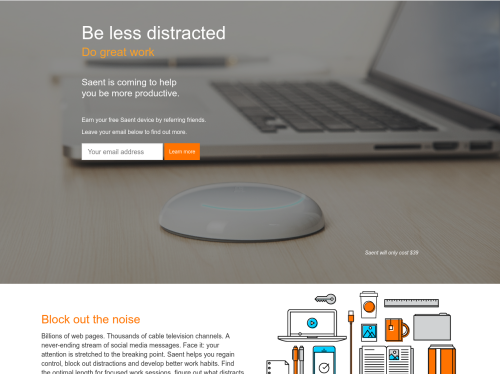 Saent: Be less distracted. Do great work. Be less distracted. Do great work. Billions of web pages. Thousands of cable television channels. A never-ending stream of social media messages. Our always connected digital world has stretched our attentions to the breaking point. With all those distractions, it’s harder than ever to focus and get work done. That’s why we’re building Saent (pronounced “saint”). We think the very technologies that got us here can also help us reclaim our attentions and make it possible to lead better, more productive lives. Saent is a connected hardware device and companion software application that enables people to work in sprints using the Pomodoro technique by blocking distractions, tracking focused work time and rewarding users for completed work sessions. We will be crowdfunding soon and expect the first Saent devices to ship to crowdfunding backers in November 2015.